Last night May 18, 2012, Isabelle played in her first piano recital. She was nervous but really excited. She objected to the dress and the curtsy, but did very well. After hearing the other girls, she is very excited about taking more lessons (we were a little tired after a year of lessons). She plays Love Somebody, Skip to My Lou, and I’m a Little Teapot. I asked Anna if she wanted to take lessons next year and she said no because she didn’t want to do the recital. I immediately went back to my dance classes, karate classes, beauty pageants, and pretty much everything else that I did that required me to be the center of attention. I think the only reason I made it through band was because it was a group thing and I was never the only one playing. I know just how she feels. 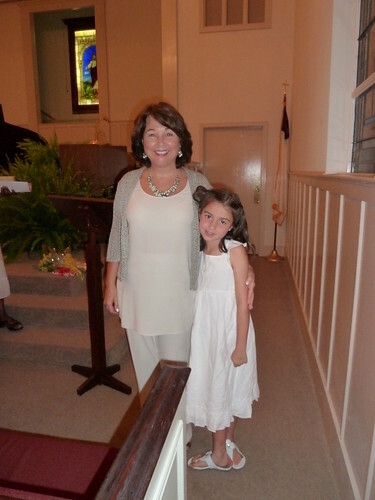 Here is a picture of Isabelle and her teacher, Mrs. Bondurant.